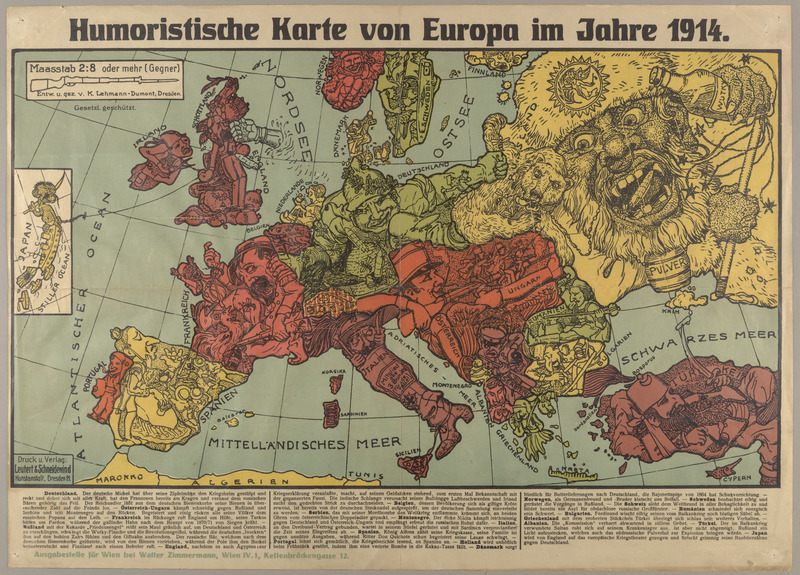 An elaborate German caricature map from the onset of World War I, like many such maps produced beginning in the 1870s. This "Humoristische Karte" portrays Germany as an innocent good guy beset on all sides by the vicious and the avaricious, "the peaceful victim of its neighbours' unprovoked aggression, who with her allies, is opposing her attackers' savagery with irresistible force." Curtis 2016, 35.An interesting comparison to a French satirical map of the War, ID #1185 (War is the National Industry of Prussia). As the War went on, the production of satirical maps largely ended, perhaps because it became so difficult to think of the struggle in anything but the most sober terms. "Germany. The German Michel (ie. Michael, used like Johnny in 'Johnny Rebel' to mean a straight-shooting fellow) has put on the war helmet over his cap and stretches and expands at full strength, already has the Frenchman by the throat and duly beats the hide of the Russian bear. The Imperial Nobility 'lets its bees out of the German hive in surprising numbers against the enemy.'" "Austria-Hungary fights cunningly against Russia and Serbia and kicks Montenegro in the back. With enthusiasm and unity, all its peoples go after the Russian bogeyman." "France in retreat calls to England for help, its Turkos (?) ask for pardon, while the Gallic rooster crows about victories according to the recipe from 1870/71." "Russia with an 'Angel of Peace' cockade gruesomely opens its maw to swallow Germany and Austria whole, swings the Vodka bottle and the whip of revolution, while the German 'insects' probe his hollow tooth and knock out his poisonous fang. The Russian bear, eager for the German beehive, is driven off by the bees, while the Pole sticks it to him, and Finland calls for a liberator." "England, having caused Egypt to declare war as well, makes its first acquaintance with the gauntlet (lit. : armored fist) while standing on its bags of money. The Indian snake gives its bulldog breathing difficulties, and Ireland tries to sever the twisted cord." "Belgium, whose people shows itself to be a poisonous toad, has already been skewered on the German fixing pin in order to be incorporated into the German collection." "Serbia, which ignited the world war with its murder-bomb, is hunched over caught by both ears by the Austrian double-eagle." "Montenegro. The fat Nikita foolishly fights against Germany and Austria-Hungary and jubilantly receives Russian rubles for his effort." "Italy, bound by the Triple Alliance, waits in his boot for the moment to intervene, armed and provided with sardines." "Spain. King Alfonse counts his war chest, his family is against unnecessary expenses, while the knight Don Quixote already raises his lance." "Portugal leans comfortably against Spain while reading the war reports." "Holland is impolitely interrupted during breakfast as a stray bomb lands in his cup of cocoa." "Denmark peacefully makes butter deliveries to German, the bayonet point of 1864 has been made safe." "Norway, as a friend and brother of Germans, applauds us." "Sweden watches developments in Russia closely and in arms." "Switzerland watches the world conflagration in all comfort and is already an asylum for homeless Russian grand dukes." "Rumania energetically forges its sword." "Bulgaria. Ferdinand busily washes his saber, still bloody from the Balkan War." 'Greece, with its conquered bit of Turkey, cleverly considers its next action." "Albania. The 'Commission' persists in waiting in quiet prayer." "Turkey. The sultan, wounded in the Balkan War, is recovering on his sickbed, but is not averse to giving Russia a light, which would cause the south-Russian powder keg to explode." "Japan is dragged into the European theater of war by England and grimly bares his predator’s teeth to Germany."